Why does tree location matter? Planting the right tree in the right place helps prevent power outages, broken underground utility lines and cracked sidewalks. 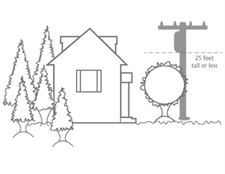 Only trees that grow to 25 feet tall or less should be planted near or under power lines. When selecting a tree to plant near your street, consider one of these species, all of which are well suited to yards in our area because of their size and growth patterns. For more information, call Tacoma Power at (253) 502-8729 or print the “Right Tree, Right Place” “Right Tree, Right Place” brochure. You can also visit our Pearl Street Arboretum, which displays many of the trees listed above, at 2402 Pearl St. N. in Tacoma. Find more consumer information on tree care through the International Society of Arboriculture and the National Arbor Day Foundation.